For three episodes in a row now, Master Of None has really dazzled me with its final shot. The sequence at the end of “Religion” that draws parallels between Dev and his father’s preferred rituals and the final shot of Dev alone on his couch at the end of “First Date,” which captures the strange solitude dating apps can induce, are highlights of their respective episodes. And “The Dinner Party” similarly ends with a telling, indelible shot. Two very long shots, broken up only by a quick cut to Dev checking his phone, fixate on Dev as he silently rides in the back of a car, taking us all the way from the hotel where he dropped off Francesca after the titular dinner party, to his place. Aziz Ansari’s physicality and expressions convey Dev’s internal monologue as effectively as an actual voiceover could. The camera stays on him as he processes the entire evening, full of regrets and frustration. Master Of None is great at getting into Dev’s head, at adding emotional layers to the character. This final shot is self-assured and lasting, but the rest of the episode wavers, less sure of itself and less convincing in its emotional storytelling. 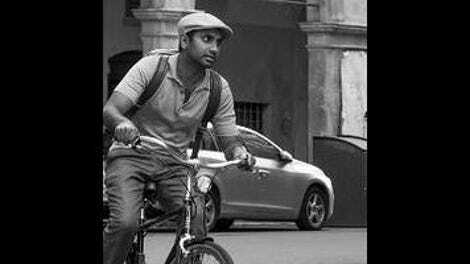 Master Of None’s varying and often unconventional plot structure is one of its strengths. But “The Dinner Party” jumps around too much, making it difficult to decipher what story—or stories—it’s trying to tell. It opens with a few scenes showing Dev in his new workplace, contextualizing his work life and reintroducing Kelvin Yu’s Brian to the show. There’s an extended bit about the Jabbawockeez, a masked dance group Brian and Arnold are superfans of that serve as guest judges on Clash Of The Cupcakes. It’s funny enough, and the scenes all underscore the banality of Dev’s new job, but unlike some of the show’s other weirdo tangents, this one is extraneous, and the humor surrounding the Jabbawockeez doesn’t land. Then, all of a sudden, we’re in rom-com. Francesca is visiting New York, and Dev meets up with her at the Brooklyn Museum, where they walk around talking about their lives, Dev sharing some details about Priya, one of the women he went on a date with last episode. In this episode, he goes on a second date with Priya that goes horribly. Somehow they keep talking about water. Their date is intercut with Dev talking to Arnold on the phone about what he’s planning for the date, setting up an expectations vs. reality situation, but that device doesn’t add much. It ultimately looks like Dev’s date with Priya goes poorly make his dynamic with Francesca appear even better by comparison. Dev’s friend Tanvi returns to push him toward Francesca, too. Celebrity chef Jeff Pastore (Bobby Cannavale, whose ebullient performance easily the episode’s highlight) invites Dev to a dinner party at his place, and Dev eventually decides to bring Francesca along. Like the museum scenes earlier, Francesca and Dev fall into a dreamy rom-com haze. They laugh with each other and crackle with chemistry. John Legend, playing himself, serenades the whole party in a particularly indulgent scene that adds to the rom-com ambiance. Even chef Jeff’s all “I see the way you look at her” to Dev. And maybe it’d be easier to fall for this if Francesca had any defining qualities as a character other than beautiful, Italian, and fun. Alessandra Mastronardi does the best with what she’s given, but it isn’t much. The episode basically screams at us to ship Dev and Francesca with all the beautiful rom-com imagery (that scene on the roof is particularly alluring and oh so New York) and other characters like Jeff spelling it out for us. And yet, I’m not totally convinced. There’s a palpable connection between Francesca and Dev, but that connection is forged through their romantic surroundings and the charm of both Ansari and Mastronardi’s performances. Their flirtations don’t exactly come out of nowhere. Something hung between them when Dev said his goodbyes in Italy. And there’s coherent build-up to Dev’s eventual frustrating ride home when he gets in his head about their interactions. But right now, Francesca seems more concept than real person, a way to shoehorn a will-they/won’t-they scenario into season two. “The Dinner Party” wants so desperately for us to fall for Dev/Francesca, but compelling romance should be built on more than a few witty exchanges and beautiful surroundings. Chef Jeff eagerly feeds Dev and Francesca sliced meat at the party and asks them to describe what they taste, and Francesca responds merely with “ham.” That’s how I feel when being fed this will-they/won’t-they set-up. It’s good, but it’s just ham. It all comes together in the end, when Dev rides home alone. It’s a rom-com left unfulfilled, and that’s unexpectedly satisfying. Tanvi’s genuine suggestion that Dev could take Jennifer Lopez to the dinner party is hilarious. Ravi Patel’s Ravi also returns, amped up about his new business venture with Anoush, Mumbai Muscle. One interesting thing about me is that I might be physically attracted to Kitchenaid mixers? Is this a safe place to admit that? The line of Kitchenaid mixers backstage at Clash Of The Cupcakes is very alluring to me.